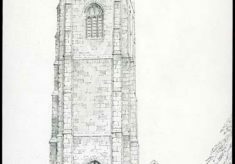 Original drawing by John Clark of the church of St. James in Kilkhampton. The drawing shows the front elevation with the tower in the foreground, a graveyard and a path leading up the side of the church to the right. The tower has crenellations and pinnacles with flags flying above. Pencil on white drawing paper.